Mannari C, Bertelli AA, Stiaccini G, Giovannini L.Department of Neuroscience, Pharmacology Section, University of Pisa, Pisa, Italy. Researchers in Italy report that inexpensive, diluted wine activates the Sirtuin1 survival gene better than pure resveratrol. The study was conducted to determine the potential health effects afforded by table wine made from Lambrusco grapes. An errant study published in 2003, researchers showed that resveratrol is the small molecule that most effectively activates the Sirtuin1 gene among all small molecules tested. The Sirtuin1 gene is akin to the SIR2 gene in lower life forms (yeast cells, roundworms, fruit flies) and is portrayed as the key gene that is activated by a limited calorie diet, a practice that unequivocally doubles the lifespan of all living organisms. However, it was discovered that the fluorescent compound used in the 2003 assay is what activated Sirtuin1, not resveratrol, thus obfuscating the gene target of this red wine molecule. There has been too much focus on activation of a single gene in control of aging, and it has been shown that calorie restriction does not up-regulate Sirtuin1 in all organs and tissues consistently, casting doubt over the use of Sirtuin1 as a measure of CR mimicry. 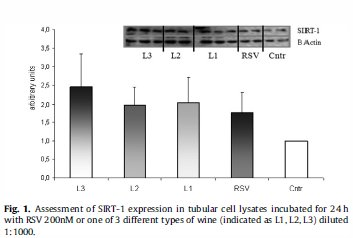 Here, in this newly published study, Sirtuin1 is activated more so by inexpensive Lambrusco wine in which resveratrol is almost negligible (a whole liter bottle contains less than 1 mg resveratrol). The molecular pathway for gene activation by wine molecules is presented in the graphic below. 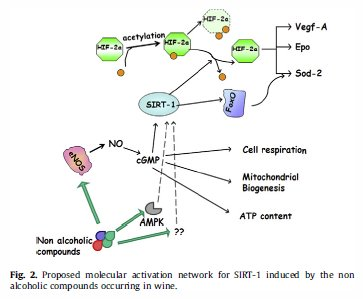 Notice the pathway for molecular activation by non-alcoholic contents in wine first activate AMPK, then SIRT1, then FOXO and HIF genes. Activation of eNOS and NO (nitric oxide) run parallel.